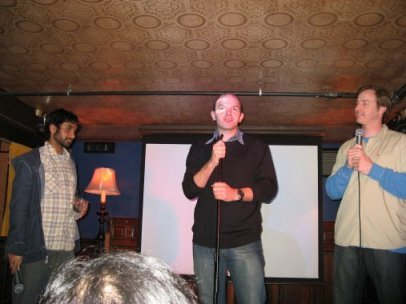 Please check out my full interview (originally done for the defunct juxtaviews.com) with MTV’s Human Giant (Rob Huebel, Aziz Ansari, and Paul Scheer) after the jump. The guys gave some really great answers to my questions, hope you enjoy it. PS The show premieres tomorrow night on MTV at 10:30 EST. It’s available for free download on iTunes now. sleep at night, you dream about? uninteresting response, hopefully Rob and Paul came through. with the cast of Goonies (not the actors, the characters). I have to ask this “” you’re called Human Giant, why? with him at the time and the name stuck. Giant’s brand of comedy in 5 words. show? If so, how will they be different? TV. Also certain legal matters like rights, clearances, and language. AA: We shot a bunch of new stuff with the Bugs and Illusionators. festival in New York, what was that experience like? hoping would come out of it? great. We never thought we’d get a tv show out of it. actively pitch your idea for a Human Giant TV show to other networks? pilot”¦we did one a year ago”¦and blammo here we are. Blogs, MySpace, YouTube, or was it something else? the development of the show. you with just one click of a mouse. anyone else write for the MTV show? writer from SNL and Tenacious D. We couldn’t have done it without him. during the filming of this show, or was everything tightly scripted? RH: We did tons of improvising. That’s where a lot of our best stuff came from. guys have worked out for the show that you are excited about? cut yesterday and I think it’s really funny. rest of the sketches I would list. did you do differently for TV than the web? our old days so we could be faster and find new bits on our shoots. That’s what we found to work best – a mix of both. more creative with our weapon choices, so for that I thank them. all way funnier than handguns. Thank you standards! gross or anything and we don’t do stuff like that just to be “˜edgy’. comedy. It offends some people. together in the context of a half hour show and a whole season? Illusionators, and Spacelords. The rest are stand alone short films. also die constantly. One of the MTV guys compared it to Looney Tunes. show feels like a bunch of short films starring the three of us. the Human Giant are scheduled to air this year? both great dudes and amazing directors too. you speak to that at all? will be avail for the DVD or online. MTV’s site and hopefully on blogs of cool people that like us. what will make you guys think your show is a success? success if we are happy with it and so far we are. enjoy it too. We will be pretty psyched if people find it funny. make sure we are releasing the best possible piece. up. You know you’re doing okay if everyone on set is laughing. of the show (Aziz, your mixtape sketch comes to mind)? driving on the highway dressed as Udon, my character from Spacelords. frequently? Any TV shows that you think are particularly funny? Jay Johnston’s stuff on Super Deluxe. Development, Freaks and Geeks, The Daily Show, Colbert Report, SNL. Lots of British stuff: Mighty Boosh, Snuffbox, and Garth Marenghi. AA: TV: The Office, Extras, and Colbert. Please name a few websites you must visit every day? answer, because I don’t like that question!!! AHAHAHAH! Do you have any tips for an aspiring comedians/writers/actors? peers, no matter if they are on stage or on the internet. AA: Put out good stuff and work hard. perfect idea. Just start shooting stuff. to produce material for the web after all the episodes have aired? nothing about cooking so I have to get started on that. Later.